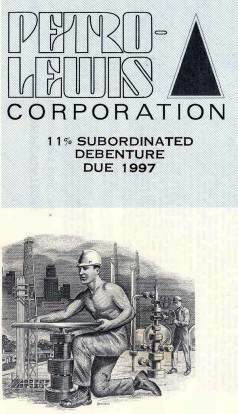 Beautifully engraved certificate from the Petro-Lewis Corporation issued in 1978. This historic document was printed by the Security-Columbian Banknote Company and has an ornate border around it with a vignette of a man turning a wheel. 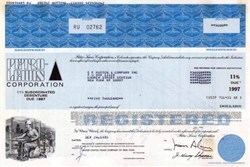 This item has the printed signatures of the Company’s President ( Jerome A. Lewis ) and Secretary and is over 24 years old. the company was acquired by Sunoco in 1984. Jerome A. Lewis was Chairman of the Board and Chief Executive Officer of Petro-Lewis Corporation. Mr. Lewis was involved as a petroleum geologist and independent oil producer for 18 years in Kansas and Colorado. Using his considerable knowledge, talent and belief in the free enterprise system, he was primarily responsible for forming Petro-Lewis in 1968. He holds a degree in geological engineering and is a member of the American Petroleum Institute, the American Association of Petroleum Geologists, the Rocky Mountain Association of Geologists, the Independent Petroleum Association of America, the Chief Executives’ Organization, Inc., the World Business Council, the Board of Directors of the American Business Conference, and the Listed Company Advisory Committee of the American Stock Exchange. In addition, he is a member of the board for Young Life, Inc., Denver Leadership Foundation and the United Banks of Colorado, Inc.